Larger-than-life Georgian warrior Giorgi Saakadze was put to death in Aleppo on this date in 1629. Through friendship with the royal family and talent on the battlefield, (English Wikipedia entry | Georgian), Saakadze had risen from the petty nobility to become one of the leading figures in the Kingdom of Kartli (centered on the city of Tbilisi, Georgia’s present-day capital). He even married his sister to the king himself. Kartli was a minor principality under the sway of the adjacent Persian Safavids but that doesn’t mean they were thrilled about the idea. Saakadze would embark on a treacherous (in both senses) career when he was accused by rival Georgian lords of Persian subterfuge, and had to flee to Persia to a chorus of told-you-sos. In this Benedict Arnold posture, Saakadze would then help direct the campaign that pacified Georgia for the Persians, and deposed the Georgian king. 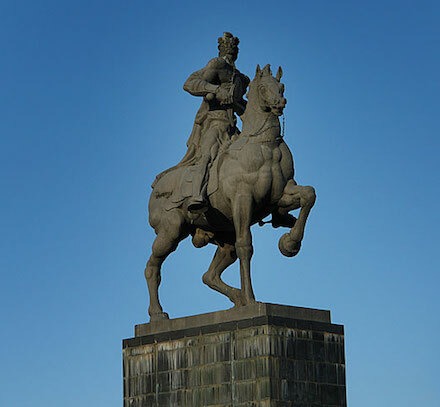 * Through Persian arms he became the de facto ruler of his prostrated homeland, and you’d be forgiven for wondering how that sort of behavior has earned him a monumental equestrian statue dominating a Tbilisi city square named to his honor. Well, Saakadze redeemed his reputation and then some by turning coat on a massive Persian invasion dispatched to put down another Georgian rebellion in the 1620s, crippling the operation while the former satrap turned guerrilla. Savvy empires know how to play the divide-and-conquer game, however, and before you knew it they had rival Georgian factions literally at one another’s throats. Saakadze had to flee again — this time, he headed west to the Ottomans. The wheel of fortune that had spun so dizzyingly for Saakadze time after time had one more revolution yet in store. Our fugitive/refugee now carried Turkish arms into the field, against the Persians and with his customary aptitude, but a figure of Saakadze’s malleable allegiances was always at risk of being damned a traitor by some palace enemy. That’s exactly what happened in 1629. What to make of such a figure? 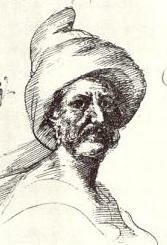 Saakadze did not want for daring, and his defections had not been so piratical and opportunistic as a Alcibiades — thus, even by the end of the 17th century, this larger-than-life adventurer was celebrated in verse with an aggrandizement upon his original Georgian office: the “Grand Mouravi“. It was not long before he had entered Georgians’ pantheon of patriotic heroes. Saakadze’s legend really took off in the 20th century, aided by that inescapable scion of Georgia, Joseph Stalin. The man was always up for reappropriating a hero out of modernity’s nascence into a nation-galvanizing icon for the Soviet state. Packaging Saakadze as a martyr to a backwards time of squabbling princes, Stalin commissioned a film that centers its subject as a Georgian hero — which was a sentiment needed when Giorgi Saakadze was released in 1943 because the Wehrmacht was also using the man’s name to brand a battalion of Georgian recruits. * The martyr-king Luarsab was no longer family for Saakadze, having put aside Saakadze’s sister with the family’s disgrace.